When Opera 10 was released early last year, it was supposed to include Opera Unite, which turns your browser into a server. Unite wasn't ready in time, and in our review a while ago we said: "We wanted to see Unite here… there's no killer app to tempt users away from rival browsers." Opera 10.10 finally brings Unite to the party. So is it Opera's killer app? We're not sure about killer, but it's certainly clever. 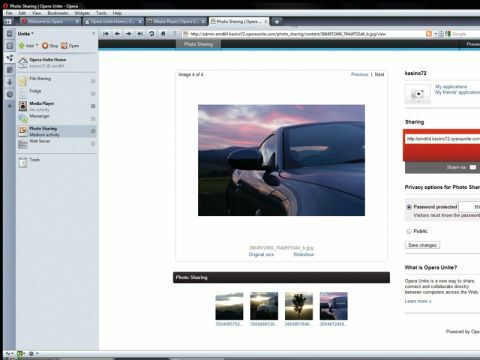 Unite is a sandboxed server that can be used by Unite applications to share data: photo albums or media streaming, for example. Simply run the application on your copy of Opera, leave your PC connected to the internet and you – or anyone you give the URL and, if appropriate, the password to – can access that content from any web browser. It works flawlessly, but we're not sure Unite makes sense for large-scale sharing. It might take a while to upload stuff to Flickr, Vimeo or DropSend, but once the upload's over, the bandwidth bill isn't a problem if your content becomes popular. Where Unite does make sense, however, is personal sharing. Because you can use Unite to serve content to PCs, Macs, Linux boxes and smartphones, it's a handy feature for frequent travellers or anyone who needs to access their work from multiple locations. Even if Unite doesn't float your boat, there are plenty of other reasons to give Opera a whirl. The unusual interface is rather lovely, Turbo speeds up web browsing on slow Wi-Fi or 3G connections and you can sync bookmarks from PC to PC. You also get the usual Opera features, including integrated email, content blocking, RSS reading and mouse gestures. It's faster than Internet Explorer by some margin, it's more functional than Chrome and it's smarter and slicker than Firefox. Nevertheless, Opera's share of the browser market remains under three per cent, while Internet Explorer 6 still gets around 11 per cent. Opera 10.10 is the best version of Opera yet, but we suspect that the browser is largely preaching to the converted minority. It's a shame.